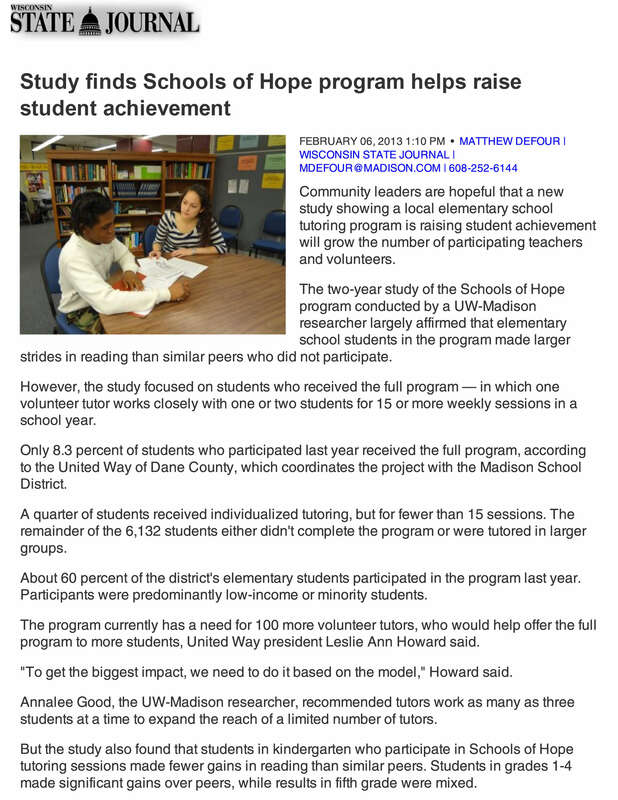 On February 6, United Way of Dane County and the Madison Metropolitan School District (MMSD) announced that new data show that the Schools of Hope (SOH) program is showing success in closing gaps in student achievement. 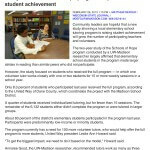 The new data shows several areas of achievement in the program which include: increased academic achievement in literacy skills in students, uniqueness and effective use of skilled volunteers, and the value of the work that MMSD teachers place on the results the program is producing. It’s reassuring to learn the Schools of Hope tutoring project is working. But more volunteers are needed to expand and improve the effort. “We’ve got to keep this — it’s fundamental — and then build on it,” said Leslie Ann Howard, president of the United Way of Dane County. A two year study of the Schools of Hope program provides a wealth of evidence that the 1 6-y ear-old literacy program works. Children who participate fully in the reading literacy element of Schools of Hope do better than peer students who do not participate. But too many kids do not participate fully for lack of adequate numbers of volunteers. Schools of Hope, under the leadership of United Way of Dane County and in partnership with Centro Hispano, the Urban League and community business and civic leaders, is a strategy to help close the achievement gap.